Custom Guitar Neck Contours, Custom guitar neck shaping, thinning, shaving and profiling. Most of all, when the time comes, Haywire Custom Shop can replace your neck for you. Because, one solution, guitar neck replacement may solve your guitar neck issues. 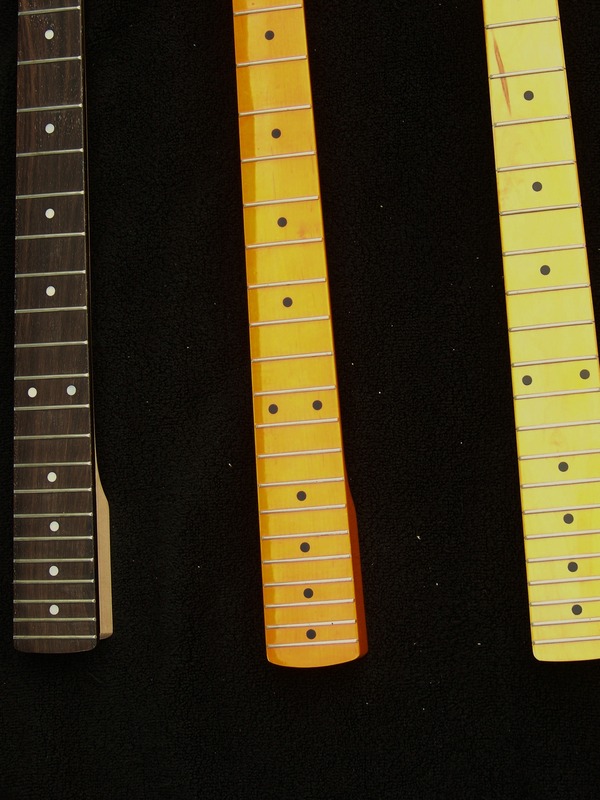 You Can Choose from Super Wide and Fat Guitar Necks to Thin and Slim! Consequently, it may be the best decision you make on your guitar. Most of all, finding your perfect neck can be almost life-changing for a pro guitar player while, looking for a positive change in playing. Help you decide on the best materials, neck profile for your technique, comfortable frets, finish and nut for your style. We can use your existing tuners or replace and upgrade them as necessary. In performing a 4-axis alignment of the guitar neck your new guitar neck will be checked and adjusted to be true and straight to ensure proper alignment on all 4 axis. This step almost always ensures proper action and allows for more accurate and easier guitar tuning and playing. A full set-up will then be performed in the following steps. We level and polish the frets to insure that all of the guitar frets are level, eliminating any possibility of fret buzz due to unevenness. Next, we radius the guitar strings. 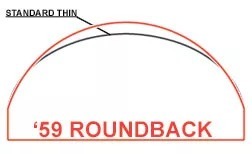 Since, most guitar necks have a curved contour over the top of the neck called the radius. We adjust the strings to make sure the height of each string perfectly follows the contour of your guitar neck. 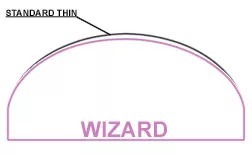 Because, once we determine the contour and then set the radius of the guitar strings, it’s time to adjust the overall height of the strings from the top of the frets to the bottom of the guitar strings accurately. In addition, we can re-check the overall guitar string height and the action all while maintaining the radius just created. The truss rod adjustment is then able to be made here. The strings will be parallel all the way down the fret board and neck straight. Finally, we set the guitar intonation. This step is done twice. 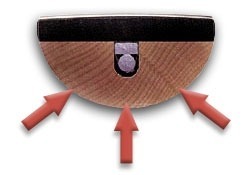 The intonation is set two times with a 24 hour “seat-in” period in between to allow the guitar to properly re-seat and settle in with the new adjustments. Neck thickness should be chosen for what best fits your hands, therefore not the “tone” it has. That should be the major consideration in the choice of your new neck. The timbre of a fat neck is noticeable however, most of the tone comes from your playing technique-not the wood. Furthermore, on an electric guitar tones are affected by everything from the pickups and amplification to pedals, picks, string gauge and speaker enclosures. In a live playing situation “wood tones” in an electric guitar will become even less noticeable. The overall sound of your guitar may be noticeably affected by a fatter/ thicker neck but generally only when you are playing without the guitar plugged in to an amp. So remember another thought. High gain electric guitar tone is very much dependent on a players technique, control and comfort with his instrument and not the thickness of a neck. However, comfort affects your playing ability, which is an important factor your in technique. Neck tone is an issue that no empirical evidence has ever put to rest. First of all, start with finding a guitar you love to play with a neck that makes playing a joy. Then, also, either send us the specs or simply send your neck to us at the Haywire Custom Shop and we’ll duplicate it for you. 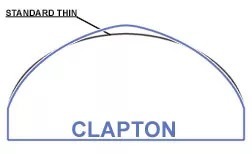 Most noteworthy, guitar back contour is the profile or grip shape of the neck back. How much wood does it take to almost fill up your hand ? While too little equates to quicker hand fatigue, hence too much even worse, you can’t reach around it. Another, question comes to mind. Due to style, do you play thumb over ? In conclusion. Seems like, almost all players gravitate to a certain feel. Probably, you can find something you really like here. In Addition, check out your favorite guitar and either compare its neck thickness, (fingerboard face to the back of the neck), to the ones below or measure your favorite neck. Because, all product names used in this webpage are trademarks of their respective owners. While, they are in no way associated or affiliated with Haywire Custom Guitars, we respect the marks. Especially Relevant these trademarks of other manufacturers are used solely to identify the products of those manufacturers whose dimensions were studied during product development. As a result, give credit where credit is due. 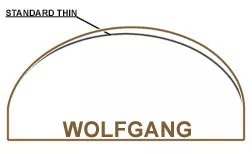 Furthermore, thanks to Warmoth Guitar Products for providing this very informative back profile chart.